Equipped with a 1,244-hp 7.0 liter twin-turbocharged V8 and a Lotus Elise chassis, this is the fastest production car in the world. This esteemed title, however, depends on one’s definition of “fastest”, and one’s definition of “production car.” Typically, for a car to break a record, the car must do one run in each direction and then an average must be taken to account for wind conditions. The Hennessey recorded a 270.4-mph run at the Kennedy Space Center, but it was only going in one direction. There is also some debate over whether the Venom GT is a production car. 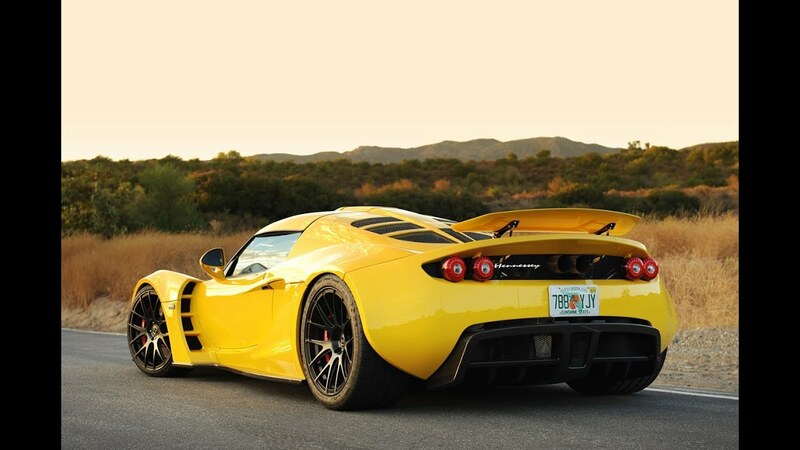 For these reasons, the Guinness Book of World Records does not recognize the Venom GT as the fastest car. The 1500 hp Chiron is truly impressive, hitting 261 mph using street legal settings. The Chiron aims to break the current speed record held by the Hennessey Venom GT. Currently, the Chiron’s top speed is a mystery. You don’t have to be a professional to drive the Chiron, since it is engineered to automatically adjust its machinery as you change speeds. The Chiron is also a luxury vehicle with a lovely leather interior and an impeccable sound system with a diamond diaphragm located inside of each speaker. As one would imagine, this car will be extremely expensive and difficult to obtain. Only 500 will be released for the first generation, and they are valued at a jaw-dropping price of $2.6 million. The original Bugatti Veyron was built when Volkswagen purchased the Bugatti brand in the hopes of building the fastest production car in the world. The original Veyron met this goal, along with having the most superlatives of any car. It had a price tag of $1.7 million and a quad-turbocharged W16 engine producing 1,000 hp. The Veyron was soon dethroned from its speed record by the SSC Ultimate Aero, but Bugatti did not give up. Bugatti came out with the Veyron Super Sport, which has 1,200 hp and a number of aerodynamic changes help the car gain a few more miles per hour. The Veyron Super Sport is still recognized by Guinness as the world’s fastest production car. The Veyron Grand Sport Vitesse, a related model, is the world’s fastest open-topped car. The primary thrill of cars is how fast they can go. If you have a need for speed, we thought you might like to know the fastest production cars out there. Sure, they’re extremely pricey, but these cars are breathtaking, even if you’re just dreaming about them.